All carpenter jeans are not alike. Dickies DP805 carpenter jean with TOUGH MAX™ technology by LYCRA® brand is two times as tough as those made of traditional all-cotton denim. 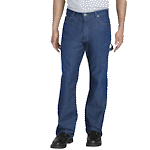 Authentic Dickies work jeans are made of 100% heavy weight cotton denim twill with traditional 5-pocket styling. They have everything you desire in a pair of hard working jeans. Fitted with five classic pockets, a dual tool pocket and a hammer loop on the left leg, you’ll be making work so much easier for yourself while still appearing fashionable. These jeans are tough because they are four times more resistant to abrasion than cotton. Not only that, but they are also made with high-tenacity fiber. This prevents tearing, ripping and puncturing. Dickies Jeans are made with 100% cotton. Cotton offers the softness you need when you are looking for comfortable work pants. Not only are they soft, but they are also strong. These work jeans have heavy-duty brass zippers and 7 keystone brass loops. Some of them even have double stitching for even more durability, even when put through industrial laundering hundreds of times. Dickies reputation rests on their attractive long-lasting jeans. The signature stitching on the back pockets and the design of the jeans make them perfect for workers who provide customer service face-to-face. They are lightweight, which makes getting jobs done easy and quick. 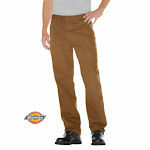 Browse our complete line of Dickies Work Jeans below. You will find each one has features that others do not, so you can find the exact pair that is perfect for you or your team.